One of the things that distinguishes Dewar’s Aberfeldy Distillery from other Scotch whisky distilleries is our interactive heritage exhibition, included in the price of your tour ticket. Our amazing archives tell the story of the Dewar’s family and their pursuit of whisky perfection, using a mixture of displayed artifacts and imagery, audiovisual presentations, interactive games and challenges. We are delighted to introduce our new bespoke multi-media app, bringing the history of Dewar’s to life in a new way. 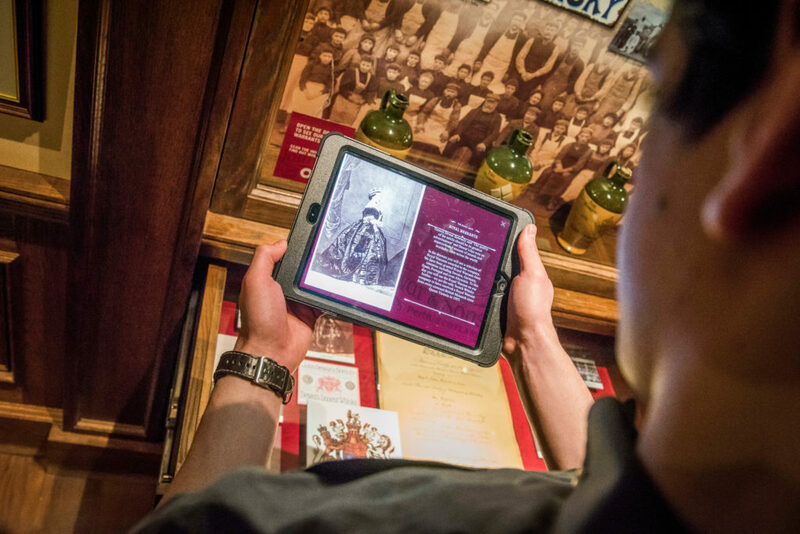 Delivered via iPads®, the app uses the latest technology to recognise visual ‘trigger points’ throughout our museum, accessing additional information, imagery, sound and video when held over them. This allows you to discover more about items that interest you, building your own in-depth experience. You will also able to view items that, due to their fragility, are not currently on display. Inspired by similar innovations in some of the world’s leading museums and art galleries, this experience is the first of its type for a Scotch whisky distillery. Book your whisky distillery visit now.